Before any more time elapses in our seminar together please allow me to share my excitement and opinions upon reading one, particular piece of the Participation Book; The Work of Joesph Beuys and Dirk Schwarze Report of Day' proceedings at the Bureau of Direct Democracy. I was personally very moved by this piece. It confirmed for me some inner suspicions I had but could not quite articulate about the close connections between the process of direct democracy and the process of art making. I think Beuys was truly prophetic as an artist in venturing into this area as early as he did, and in the manner that he did at Documenta 5 in the "art world". To begin with, Beuys explains he wants a system "ruled from bottom to top" (p. 120). How popular is that thought today? The answer is so obvious. But Beuys situates the artist and her practice as a vital harbinger of this idea back in the early 70's. In my opinion, this is still a revolutionary idea today and forms the basis of much art/democratic process behind the many art practices we are learning about. represent the voice of the "the many". In addition, we have been fighting the large anonymous hulk that is corporate "development"/America. To do so, we have used our own voices, and the voices of our neighbors as a simple but effective means of protest and reminder of humanity. We have tried to fight the proliferation of enormous luxury condos developments all over our small scale neighborhood with valid questions about infrastructure; safety; schools; environment; and more, i.e. with community concerns that affect us all. What is the role of an artist in an enterprise like this? The answer is mulit-layered and deserves a post all its own. It also lies in our very own "interdisciplinary art practices", does it not? I left off my last post describing the impact of one flyer upon my neighborhood, Link. , the one penned by "Athena Lloyd Wright",an anonymous artist speaking for the neighborhood whose voice was quickly heard. Others responded so enthusiastically because others wanted their authentic voice to be heard by those in power too. One voice quickly became many. Three thousand people in Carroll Gardens both on-line and off immediately signed the petition to "Protect Our Homes" . (see the CORD blog). Many left heartfelt comments. * Many others wrote their personal stories into a linked blogging world that immediately became a network of "citizen journalists" around issues such as the ever popular, over-development issue facing all of Brooklyn, not just Carroll Gardens. The blogs are now linked daily to all the major daily newspapers and taken quite seriously in fact. They report so much news that is too difficult for a reporter covering several neighborhoods at once to cover. Many were started by artists and they reflect that feeling naturally while also reporting factually. 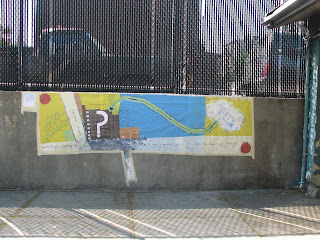 A search for the Democracy Wall at the Gowanus Lounge Blog will yield several results. (gowanuslounge.blogspot.com and/or gowanuslounge.com). * These comments and some images from the Democracy wall and much more will be the content of an upcoming exhibition I am taking part in: "Brooklyn Utopias" http://brooklynutopias.com More on this exhibition in a subsequent post. Beuys states: "This is a model of freedom, a revolutionary model of freedom. And there also must be free press, free television, and so-on, independent of state influence" (p. 124). "We must probe (theory of knowledge) the moment of origin of free individual productive potency (creativity)" (p. 125). I feel I have lived these words and seen their power on the streets of my Brooklyn neighborhood as I have witnessed the utter joy of people realizing their ability to speak up in creative ways that they can invent on their own with their own creativity. How do you think a "direct democracy" would work in the USA? Could it work? Would it be better than electing representatives, so many of whom are owned by various special interest groups? How would that affect our art and our work as artists? "Do you see yourself as an individualist and do you see your office here as an isolated department?" Beuys: "No in no way. I do not see myself as isolated here. I have all kinds of possibilities here. I can speak freely with everyone. No one has prevented me yet....." (p. 124). 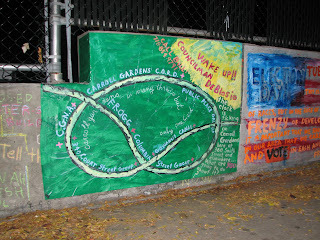 Was the "Democracy Wall" in Carroll Gardens owned by any one person and/or did it exist in isolation? Answer: No it was an ongoing dialogue between the community and the issues affecting it. It was created by all and belonged to all. What are the pressing issues in your neighborhood? Could there be more "Democracy Walls" all across America? Triada, Joseph Beuys has been my spiritual activist mentor since 1996. Why did it take so long to connect with his work? He would have saved me so much time and wasted myquestions about the validity of my thoughts. I could have actually stood in his presence...if I had only known. Yes, you too walk in the steps of Joseph but I believe he would not be satisfied with just that. As he fathered the Green revolution he knew that an artist like you would step into your creative power and give voice to the masses at the street level, the "ground". This opens one up to criticism. Please remember that you are not expected to take the weight of the masses on your shoulders. Your task is to be a conduit for the message. You are empowering the energy so that the masses have a voice. I ask that you learn an important lesson from Joseph. He did not take care of his physical body. He pushed and pushed and pushed himself to complete exhaustion. Take car of yourself the way you are taking care of your community. PS lets go to a Beuys exhibit!!!! Susan, thank you, on so many levels. I am very flattered in more than ways than one. As for Beuys, yes, why did it take us so long to understand? I think because he was far ahead of his time, that is why. I am going to be giving voice to some of the petition signers in an exhibition I am having this month. I will do a separate blog on this topic. I also was a "poll watcher" this past week on Tuesday at the NYC Primaries. That was quite a day. I am sure Beuys would have approved. We are one silly-looking machine away from power, Susan. The voting machines struck me as the oddest contraptions I hd seen in awhile as I was watching over them; each one was a kind of Coney Island-like, arcade gaming machine device from the 1940's or longer. The impossibly low voter turn-out completed the strange, barren image I have of that day.